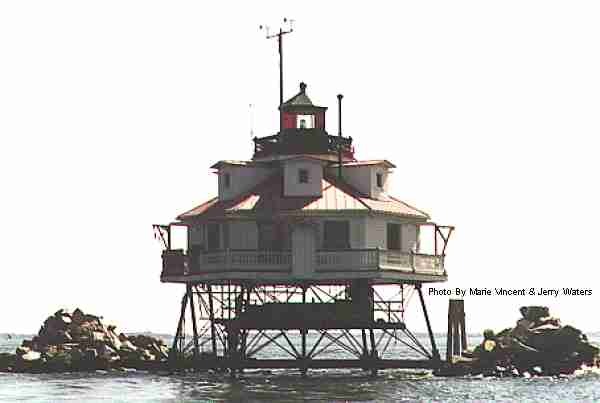 Perhaps the most photographed lighthouse in The Chesapeake Bay, The Thomas Point Shoal Lighthouse is the last screwpile structure left on its original sitein the bay. It went into service on November 27, 1875, to replace a light on the shore at Thomas Point at the entrance to the South River. The Lighthouse Board thought that a light on the shoal would better serve the shipping traffic in the bay. A screwpile with a hexagonal 1-1/2-story building perched on the spidery legs, the light's lantern rises out of the center of the building. During its early years floating ice tipped over the fourth-order lens in the lantern. In time heavy riprap was placed around the lighthouse to fend off the ice. With its red roof and white sides this picturesque lighthouse is a fine example of its type. The light and fog signal, both now automated, are still active. From the Washington Beltway, Interstate 95, 495, go east on US Route 50 to exit 22, just before Annaplois. Exit south on State Route 665, Aris T Allen Blvd. This road becomes Forest drive. Go about 2.5 miles until you come to Arundel On the Bay Road. There is a sign for the Coast Guard Station on the right at this road. Turn right onto Arundel On the Bay Road. Follow Arundel On the Bay Road (also called Thomas Point Road) for about 1.4 miles untill the road turns into Thomas Point Road. Continue on Thomas Point Road to the end of the road. This is only about a half mile. At the end of the road is Thomas Point State Park. The gate opens at 8:00 am. Drive to the end of the road in the park and the lighthouse can be seen 1.25 miles due east.